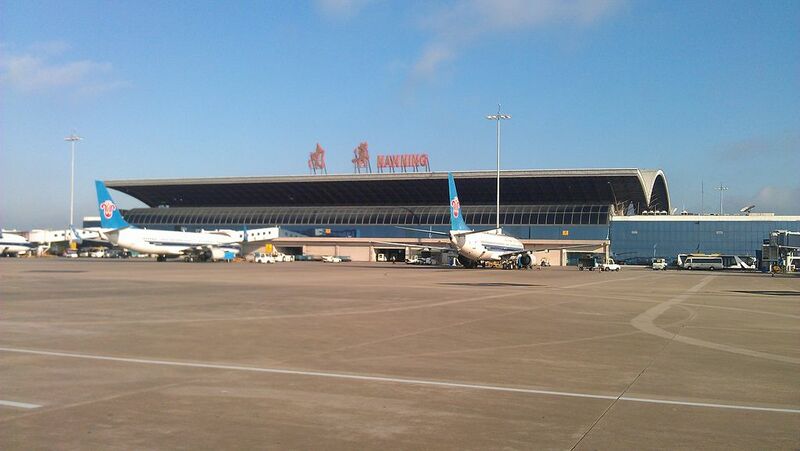 Nanning Wuxu Airport (南宁吴圩机场) is an airport in Nanning, Guangxi, People’s Republic of China (IATA: NNG, ICAO: ZGNN). The airport is 32 km from the centre of the city, and the airport was built in 1962, with improvements made in 1990. With 106,000 m² of apron, 25,888 m² of terminal space and five jet bridges, the airport was designed to handle 2.5 million passengers traffic annually. After reaching 1 million passenger traffic in 2002, the number of passengers jumped to 2 million in 2006. In 2009, 4.52 million passengers used this airport. During World War II, the airport was known as Nanning (Nan Ning) Airfield and was used by the United States Army Air Forces Fourteenth Air Force as part of the China Defensive Campaign (1942–1945). It was used primarily by reconnaissance units, which operated unarmed P-38 Lightning photo-recon aircraft that flew over Japanese-held territory and obtained intelligence used by combat units. Detachments of fighter and bomber squadrons also operated occasionally from the airfield, along with being a supply point for the 2d Combat Cargo Squadron, which air-dropped supplies and munitions to ground forces on the front lines. At the end of the war, the transports also hauled men, horses and mules to the airfield The Americans closed their facilities at the end of October 1945. Beside parking facilities and taxis, two airport bus lines connect the airport with the city center: Line No. 1 serving the Chaoyang Road Airline Ticket Office (near Nanning Railway Station) and Line No. 2 serving Wuxiang Square. The new terminal under construction is scheduled to be finished in 2012. Meanwhile, with passenger traffic almost double the designed capacity and cargo traffic 3 times over the designed capacity, a temporary solution is urgently needed before the complete of the new terminal.